The material helps to develop analytical and interpretation skills, the ability to form and express individual opinions and with the help of these, to understand art and culture. Literary texts are always presented in context, together with well-chosen other texts and an impressive range of works of art, from visual arts (paintings, sculptures, posters, films, comic books) to music and videos of plays. Although the material itself follows a chronological order, the topics expand over various eras and art forms to cover universal issues that a teenager can relate to. The material achieves a very engaging balance in the representation of culture both in the classical/contemporary and the classical/popular dimension. Some tasks require teamwork that develops the ability to work in groups, to assign roles, make plans together, share responsibility and negotiate with others. The book's integrated approach of combining literature, language and culture is much appreciated. The organization of content into 4 main thematic units allows for the combining of a chronological and a topical approach, and for presenting literary texts in broader sociological and cultural contexts. The great variety of literary texts, authors and contextual references promotes a multicultural approach and successfully brings together Polish, European and world literature and cultures. Each literary text is accompanied with a great variety of questions and tasks aimed at developing the student's cognitive, social and emotional skills. Students are encouraged to expressed their views and opinions and discuss them with peers. The book also includes suggestions for more elaborate tasks and projects in pairs and in groups. The book successfully integrates 'traditional' literary textual genres with 'modern' media. Tasks invite students to use a variety of Internet sources and also to write and develop their own Internet pages, blogs, YouTube videos etc. There is a good variety of forms for presenting information as well as a variety of learning tasks. Different forms of art (literature, theatre and cinema) are successfully related to one another. It is good that students are often invited to express their own opinions. 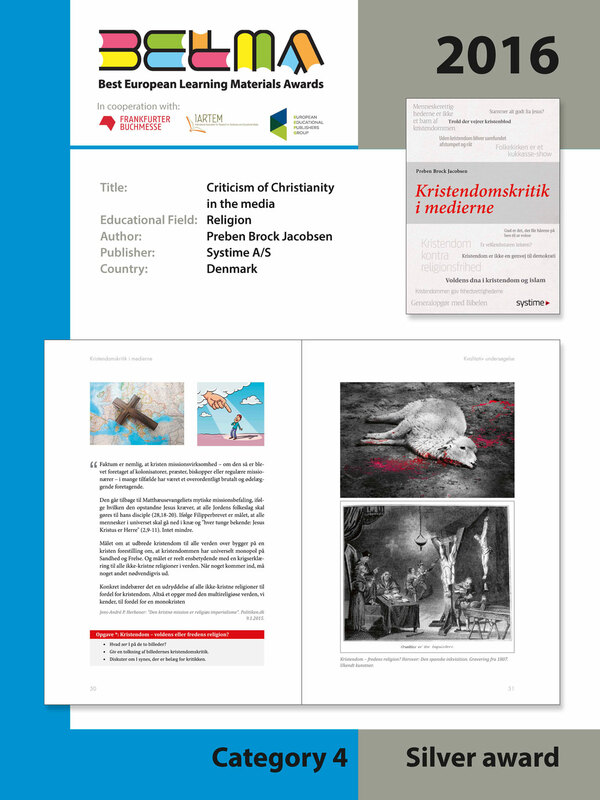 Students' critical thinking is encouraged by presenting different perspectives (knights and Mohammad Omar (p. 74), Romeo and Juliet and John Paul II (p. 161)). There are many reproductions of interesting and relevant paintings even in the part of the book which concentrates on grammar. Learners have different interesting tasks: to find the correct letter, help animals to dress, compose a picture etc. Teachers' clear instructions help children to play the games. Socialisation is clearly demonstrated in Circus Park. For example, children are asked to help animals. Text and image are connected so it helps those beginning with reading. The material offers playful and diverse activities for teaching basic concepts to young children. The material is based on different animals, and lively and funny films introduce the topics and are motivating for the children. The material is supposedly available in different immigrant languages, which helps immigrant children to learn concepts in their mother tongue; this is also helpful to learn their second language. (The jury was not able to access the relevant sites). 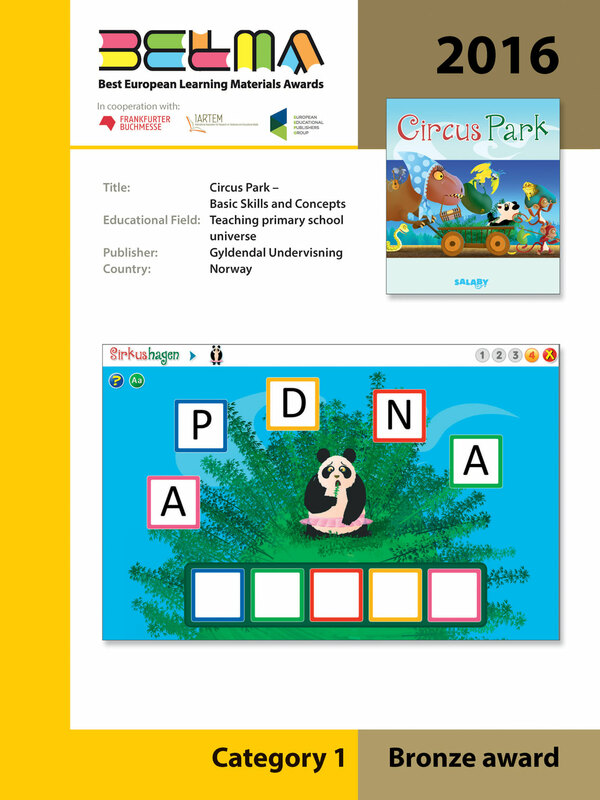 Play-based, visually very attractive, child-centred and age appropriate website that provides very stimulating and motivating online learning environment for learning basic skills in main subjects for pupils at primary level. The website is very child friendly and keeps learning fun and a positive experience. Games and role-plays are linked to real life situations (e.g. one of the games on learning to add simulates a shopping experience). They link abstract concepts with concrete situations and experiences. At this age this is particularly relevant. The texts are accompanied by narration, which is very useful particularly as learners are just developing their reading skills. Each task provides immediate feedback and encouragement. Each basic concept has several different games to explain and practice the new concept, and a small quiz to test the learner's skills acquisition. There are different sorts of activities (dragging the correct answer, painting, connecting, listening, inserting the correct answer, filling out working sheets) that effectively allow different pathways for learning and practising basic skills. 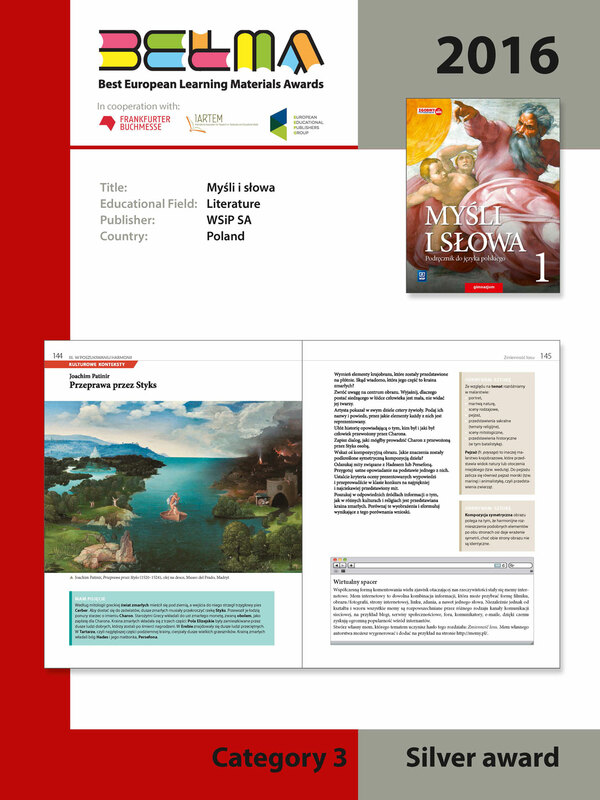 Each textbook has five chapters, and each chapter is well organized into four 'worlds', the reading, speaking, language and writing 'worlds'; this is presented in the first spreads and give the readers a good overview. Each chapter has clear learning goals explicitly presented to the students. There is a great deal of variety and humour both in text and images. The content builds on the importance of developing literacy, i.e that writing, reading, oral and image competence is of great importance in modern society; this is clearly reflected in the Norwegian curriculum). The selected texts are written by Norwegian and international authors, and are both modern and classical; this introduces a variety of approaches and broadens the reading experiences of the students. There is a rich set of exercises, both formal and creative, individual and co-operative. Multicultural issues are well represented in both images and texts. The teacher's guide gives a good introduction to the ideas behind the learning material and a very useful collection of extra tasks. The whole set demonstrates high production standards, including quality of paper, print, page layout, visuals and effective (age appropriate) choice of fonts. There is a strong emphasis on a multicultural perspective which is consistently visible in the selection of literary texts, authors (combining international and national authors and perspectives) as well as visuals. The great variety of visuals is particularly effective in introducing people of various ethnic and religious backgrounds, and from different historical periods, but also people of all ages. The material's strong feature is an integrated approach to developing pupil's skills in reading, writing, grammar and oral skills. It also promotes integration of other subject areas - geography, history, art, culture. The textbooks have a very clear structure. Simple visual symbols for different sets of tasks help pupils to work with the material effectively. The Teachers' Book provides detailed guidelines on how to work with the textbooks and includes a great variety of methodological suggestions for work in the classroom. The book also includes plenty of additional photocopiable work sheets for pupils. The teacher's book of more than 300 pages offers an impressive and well thought out collection of activities and tasks to use with the learners - highly motivating for beginners as well as experienced teachers. The textbook has seven chapters about the European history; it offers a lot of information and takes young students seriously. Colours are used pedagogically in a positive way to organize the chapters. There is an informative overview of all chapters and their content at the beginning of the book. Each chapter starts with a spread which points out the main topics for the students; this provides a good overview for the students. Both original photos, paintings, illustrations and good quality maps are used in an informative way, and the numerous images contribute to a good variety in the spreads. The textbook takes young people's interests into consideration by integrating sport, film and music. Boxes with quotes and examples contribute to motivation. Images are present in the workbooks; this contributes to variation and motivation. The tasks in the workbooks seem varied and facilitate differentiation. 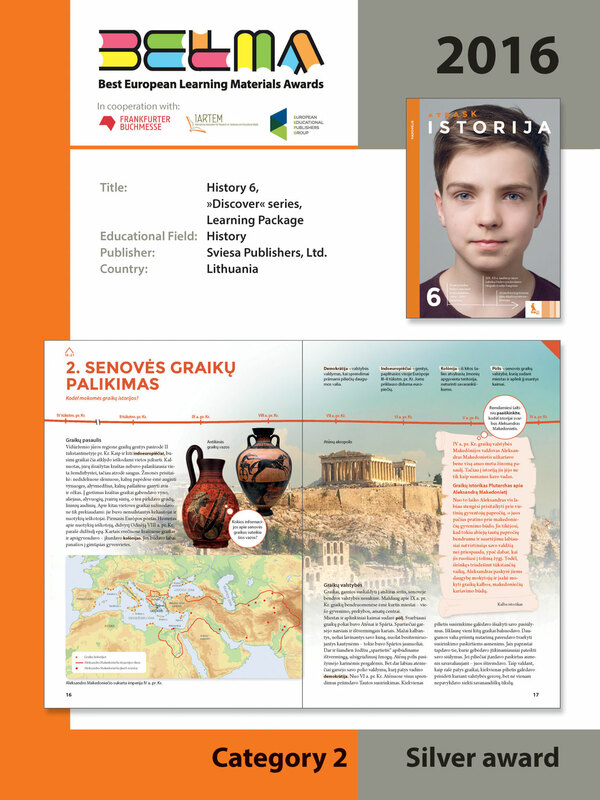 The specific positive feature of this textbook is that it guides students to think about historical events and to discover the relationships between them. The book has an attractive layout and the double-page principle is successfully employed. Learning aims are formulated at the beginning of every lesson. Good variety in the presentation of the material - main text, maps, Illustrations, comments from historians, additional texts, time-line, etc. Basic terms are briefly explained at the top of the double pages. Tasks of different complexity are provided. Teachers' feedback has been used to develop the material. The main textbook has a very attractive and modern design, and page layout. In addition, the authors and the publisher kept it fairly 'slim' and appropriate for this age category. The book presents a well-balanced political, cultural, social history, and effectively combines national, European and world history. The use of maps and chronological historical lines across all chapters is particularly effective, helping pupils to follow changes and historical developments over the centuries and place them geographically. The pupil's workbook provides great variety of tasks and activities, making pupils really engaged in learning history. A very comprehensive on line materials pack providing high quality language learning materials as easily exploitable, by teachers, or by learners as an autonomous learning tool. The material enables the users to take advantage of a wide choice of very relevant, effective digital language learning resources, including assessment activities. The user of the online material can very easily choose to work with any of the texts and connected activities (Did you get it, Work with words, Present) of the 6 categories at 3 different level of difficulty. The application takes into account differentiation as it enables the teacher to easily, assign different texts or exercises to different learners or groups of learners at different levels, track the learners' progress thanks to particularly well-designed and efficient Learning Management System (my Site). "Present" is a really innovative learning activity which enables the learner to easily plan, design and display sophisticated presentations about the texts studied, embedding videos, sound, pictures which can be viewed by the other learners via the "class wall padlet" facility. A series of really well designed video tutorials (Reading tools, students' presentations, for teacher) enable learners and teacher to easily work out how the various appliances of the LMS can best be used. A rich interactive material with many activities: listening, talking, writing, watching films, exercises. Many interesting topics for young people; the main categories are wildlife, countries, sports, youth culture, music, and technology. Each subtopic has three levels of complexity, and the students can train on one level and go to the next one using the first level as basis; the three levels provides differentiation in a good way inside the same framework. The students are challenged in many ways through a variation of exercises; they can save their work on My Site, and they can make presentations through slide shows, written texts, and videos on the Class Wall. The pages are colorful, and the images are of high quality. The texts are spoken in a good way by mother tongue speakers. The teacher can give homework by using a special teacher's button leading to the homepage pages. There are a lot of funny and playful lecture starters that can be organized by the teacher (stealing marshmallows, playing knots and crosses etc. ); the exercises build a vocabulary and a grammar that can be used in new activities. The technology is easy to handle. Each textbook displays five chapters on the first spreads well organized with colours as symbols; this gives the material a good structure. Each chapter opens with clear learning goals explicitly presented to the learners, important terms to be learned, a special exercise as a start and a motivating cartoon. Each topic (inside the chapters) starts with clear examples that serve as a background for the learners' exercises. A bat serves as the learners' good adviser and gives useful hints. Multicultural issues are presented through illustrations and names. The illustrations are funny and imaginative, and therefore motivating for the learners. 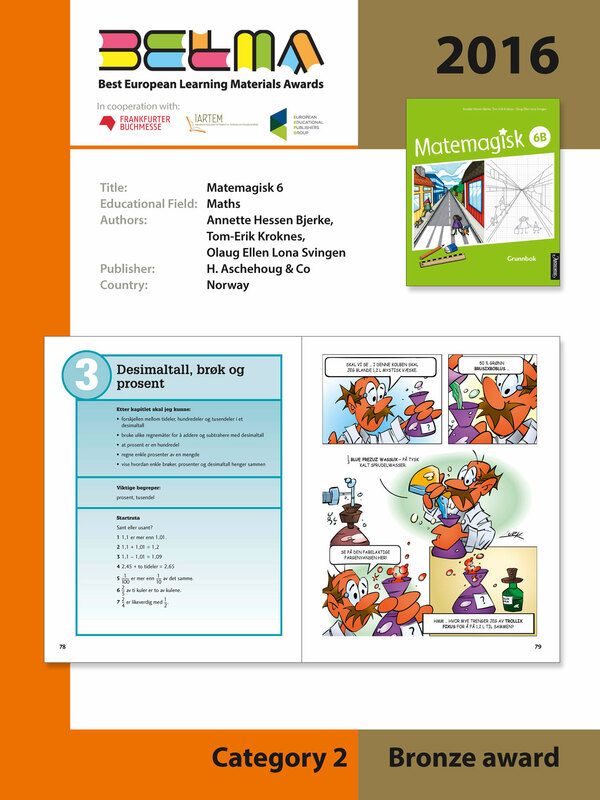 The learning material takes differentiation into consideration as both textbooks and workbooks have tasks for all learners at three levels ('spor' 1, 2 and 3, organized by colours). The tasks are clearly marked for individual and cooperative work. The teachers' guide has a good introduction to the pedagogical ideas in the material, and many extra tasks to each chapter and each topic within the chapters. Each chapter has a helpful short summary. The cover page of 6B conveys the essence of mathematics, i.e. abstraction. The materials present a rich mathematical world to the learners with age relevant illustrations. Many possibilities for discussion and work in smaller groups are provided - conversations between the learners as well as different levels of problem-solving are offered throughout the material. The overall design and page layout of the three books is really straightforward and attractive. The illustrations are varied, relevant and age-appropriate. The learner's book is efficiently introduced through a double spread page which clearly signposts the structure of the books as well as the objectives of the different types of learning activities/tasks, including the on line extras. One of main aspects of the added value of the materials lies in its really high quality level of production in terms of printing, text and illustrations layout, as well as binding. Learner's book, Read and write as well as Basic skills books use a noteworthy approach to language learning, i.e. they use the target language (English) for contents and activity instructions all through the books except for the occasional translation of difficult words. The signposting of the various activities and learning tasks is particularly well-designed with easily recognisable icons, mind maps or use of arrows to make the language structure more explicit. 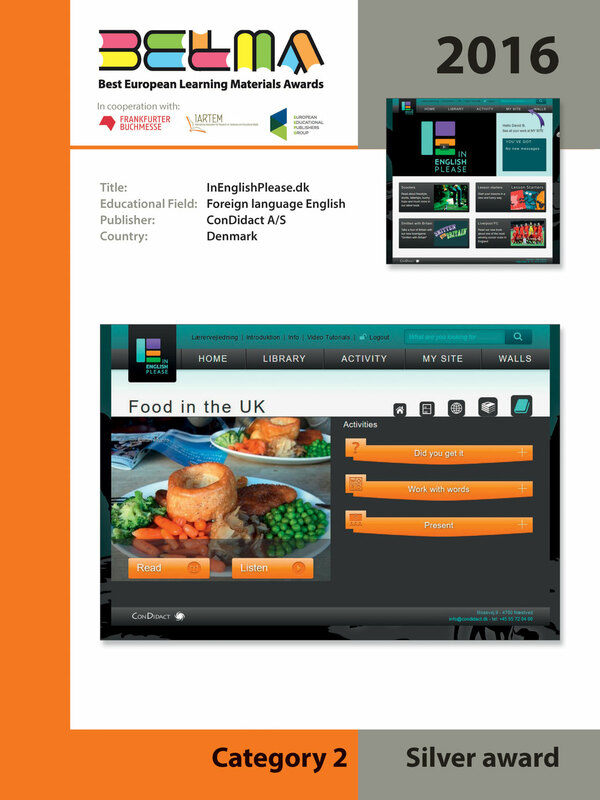 The material relevantly provides, in specific units (India) or chapters (Multicultural Britain), activities and tasks aimed at inviting learners to reflect upon the knowledge and understanding of the other cultures in English speaking countries. The application, from which additional online resources can be retrieved, is particularly well designed, with an easy navigation through the various sections as well as a really fast and reliable loading of well laid out exercises and activities pages. Enter 8 consists of rich material taking the students seriously through challenging topics. The textbook has a good guide to the books as introduction. Every chapter starts with the students' learning objectives explicitly presented for the students. Many of the texts are authentic texts from the English speaking world; there are both contemporary and historical texts. There is a wide range of texts, images and activities in both printed books; there are also extra activities at the end of each chapter. Important words and expressions are listed in the margin close to where they are used the first time. There is a good quality chapter about language and grammar in the basic skills book. 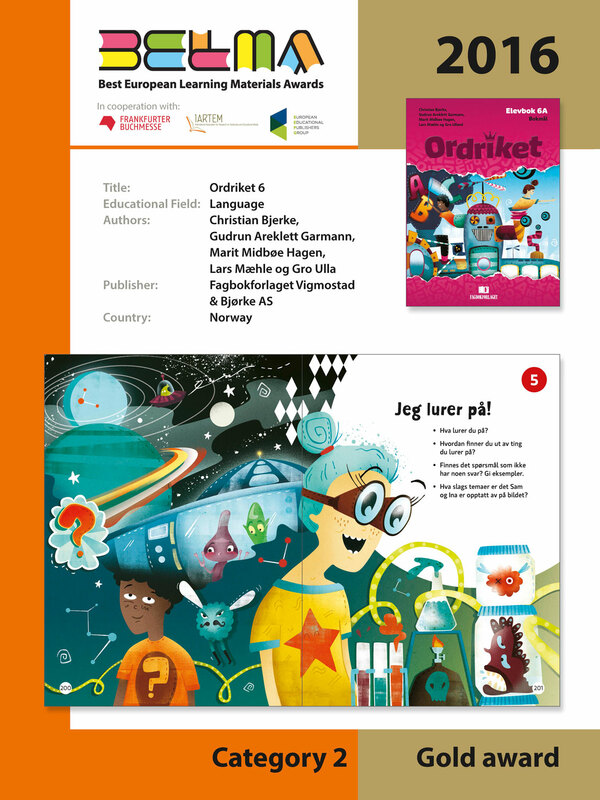 The basic skills book contains very useful and entertaining activities developing oral, written, reading and digital skills that are emphasized in the Norwegian curriculum. The online materials complement the printed materials and are equally well laid out and presented. Authors : Daniel Domert, Jonas Bjermo, Jenny Lundin Jakobsson, Anita Ristamäki, Lars Madej, Mia Öberg M.Fl. This rich material emphasizes differentiation through a track system and several learning styles (sound, filmed lessons, reading, writing etc.). The structure of the chapters is presented in a very simple and clear way, and colours tell students where they are in each chapter. There is clear focus on five mathematical skills (problem solving, methods, concepts, reasoning and communication), and the skills have a clear progression from grade to grade. Each chapter starts with a "maths talk" that serves as motivation. There are some well-designed summaries about the most important issues at the end of each chapter. Mathematical figures are clear and easy to understand, as well as illustrations and colour photos which are really relevant and make the books motivating. There are many exercises to be solved along with other students. The teacher's guides are rich and helpful for the teacher providing effective guidance, tests, logs, work sheets etc. The material focuses on the five key mathematical skills in an effective and structured way - everything is well balanced. The textbook is structured around specific guidelines to the learner such as 'continue', expand', repeat', 'one more round' and 'diagnose' which enables the learner to be more conscious of his/her own learning path. Emphasis on differentiation is one of the strongest features of the set. Clearly marked tasks and exercises on various difficulty levels are provided in each chapter, thus allowing students to work effectively with the book according to their abilities. It is a well-designed and very attractive textbook with clean and modern 'look' - including page layout and use of visuals. Mathematical concepts are clearly explained, with examples and a great variety of exercises for practice, including many references to real life situations and links to other fields of study (such as biology, geography, art, architecture) and healthy life-style. Teacher's book displays a high production standard and provides plenty of materials to help teachers with a formative assessment of individual pupils. The whole course has a very modern look and feel - and very much a "business" feel. The audio and video components are authentic and interesting. There is a variety of accents from Europe and around the world, making this a very international book. The layout is very clear and structured. The illustrations always serve a definite purpose. There is good support on a website with vocabulary lists, grammar summaries, etc. There is also relevant and useful support for teachers with lesson plans and differentiation exercises The page player app is a gimmick, albeit an interesting one. The online component provides useful additional material and is easy to use. Excellent material designed to develop analytical and critical thinking: it helps students to build their skills in important areas like media analysis, comparing abstract ideas and discussing complex moral and scientific questions with the help of analysis of discourse. By examining arguments from different angles and positions, and analysing quantitative data, the material develops empathy and tolerance by approaching the often sensitive and emotionally charged topic of religion in a thoughtful, impartial, analytical way. The material is very flexible: chapters can be processed in any order depending on the needs of the students and the class; exercises and discussion topics have different levels of difficulty that allows for differentiation. The structure is clear and simple with a short, concise note to teachers about teaching ideas, cross- curricular and differentiation opportunities. Interactive recap exercises at the end of chapters help to summarise and solidify abstract ideas. The content is of a high quality and is based on twelve positions of criticism and defense of Christianity in the media; the material takes the students seriously as the content is challenging. The material is based on a qualitative approach with discourse and argumentative analyses and a quantitative approach where the students learn to handle 'big data'; both approaches are useful and prepare students for higher education. Rich and engaging tasks give the students opportunities for discussion and for developing their own opinions. The material brings in the voice of thinkers, authors, film-makers etc. ; this expands the perspectives on many of the difficult questions that are considered. The video clips are of high quality and relevant to the topics. Important notions are explained by clicking on the words in the texts; this makes the texts easier to read. There are interactive tasks in separate chapters where students can test out their opinions. The material has a very interesting conceptual approach - presenting various critical and contradictory positions on Christianity in the media. Various types of activities encourage students to develop their analytical and critical thinking skills. 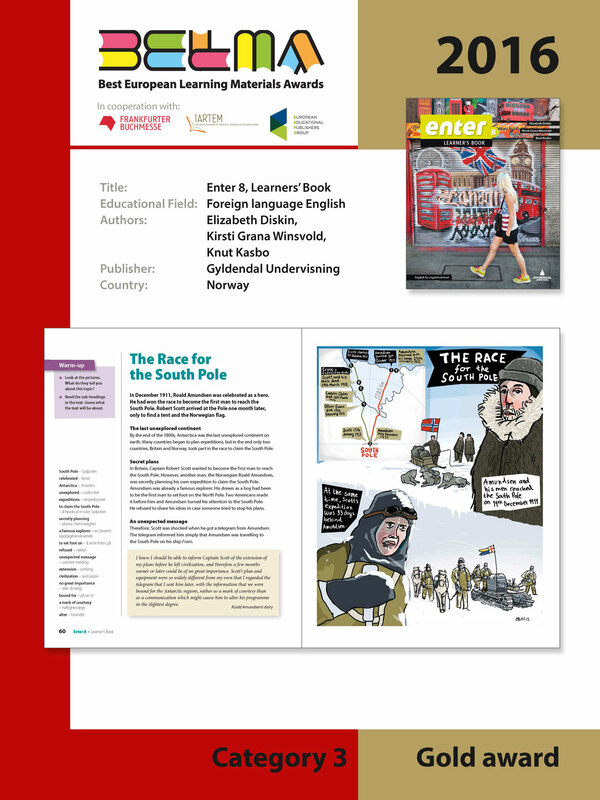 The author brings together a great variety of resources, including texts from newspapers and other media, cartoons, videos, photos and other visual materials. Comprehensive yet clear range of products, excellently dove-tailed. Clear, modern, uncluttered layout, nice big typeface for students not familiar with the Roman alphabet The page player app is an interesting gimmick. Picture band at right hand side of the page aids comprehension. 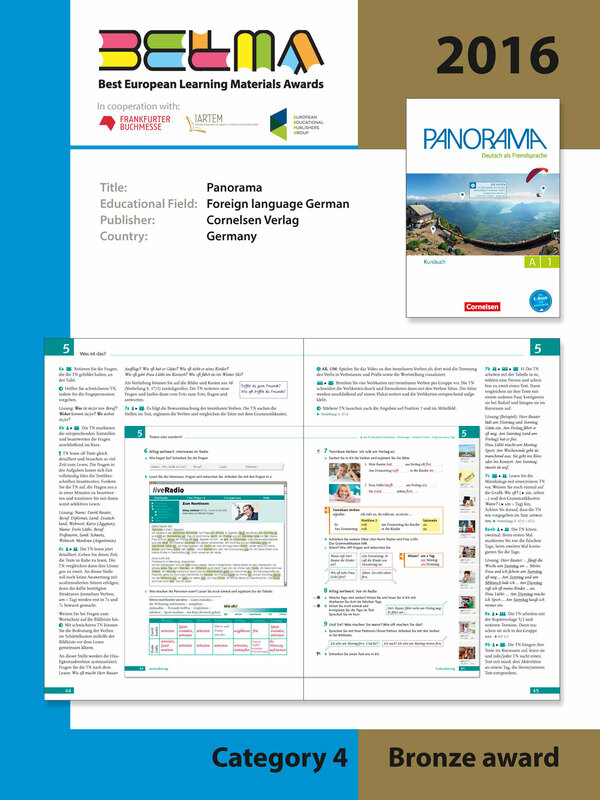 Positive balance between relevant and engaging content and the demands for basic language skills Gives a linguistically and visually pretty accurate image of the German speaking countries Authentic German audio (adapted for educational purposes). The overall design and page layout of the three books is straightforward and attractive. The illustrations are efficient and age-appropriate. Both the learner's book and the test book are suitably introduced through a double spread page which clearly signposts the structure of the books as well as the objectives of the different types of learning activities /tasks, including the on line extras. The material enables the users to take advantage of a wide choice of relevant print and digital language learning resources, including assessment activities. 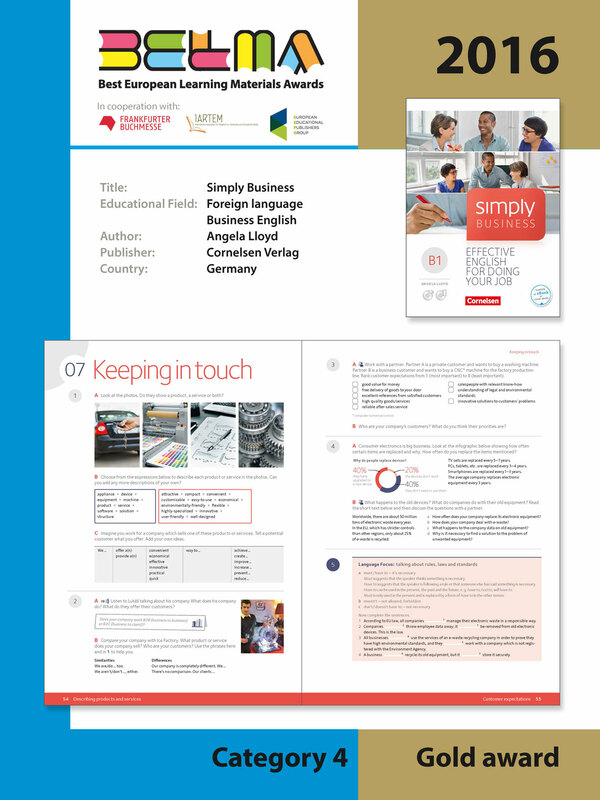 The material pack takes into account the intercultural dimension by providing specific activities and information about the German-speaking countries, Germany, Austria and Switzerland. All three printed materials (learner's manual, work book and test book) help learners become conscious of progress made in relation to the learning objectives, as keys to the exercises and tests are systematically provided, as well as "Punkte gesamt" boxes in the "Alles klar" section of the work book enabling learners to self-assess. 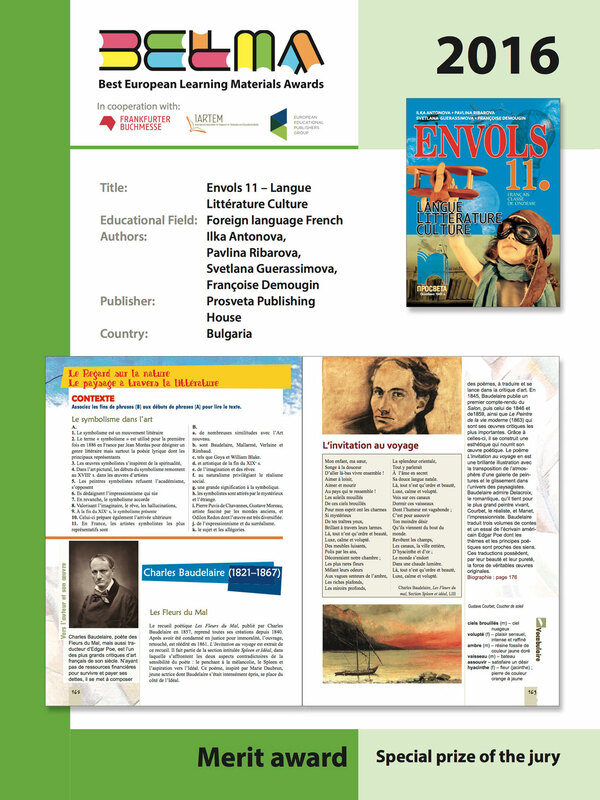 This material builds upon the knowledge previously acquired by learners in other fields such as the cultural, social, and political history of France and French-speaking countries, as well as Bulgarian Literature, History and Civilisation, Art and Music. The course enables the learners to reflect upon the culture of other countries thanks to the provision of a very wide range of French literature texts as well as Francophone literature works from all over the world. The materials provide a great variety of learning activities and tasks which meet different types of learners interests and needs, as well as making challenging connections to other academic or artistic disciplines or suggesting Internet links to related relevant cultural resources. Both the learner's book and workbook use a commendable approach to foreign language learning, i.e. they use the target language (French) for contents and activity instructions throughout the books. The workbook usefully matches and complements the learner's manual in supplying stimulating and playful activities like "d'un autre point de vue" dealing with French cultural heritage or "Projet" proposing some motivating groupwork activies involving the whole class. Texts from many literary writers and data from the cultural, social, and political history of France provide a rich and varied content. The textbook and workbook include many different exercises that clearly support language acquisition. The students' thinking skills and value systems are developed via questions aimed at the analysis and interpretation of literary texts. The teacher's handbook includes answers to exercises in the students' book which may be helpful for less experienced teachers. According to the information from the publisher, the CD includes audio files which support the learning process. The method of working through general life topics by reading and interpreting original French and Francophone texts suits the age-group and the advanced level of the course very well. The inclusion of Francophone writers challenges students' cultural stereotypes, broadens their literary horizon and promotes empathy and tolerance. The structure of the chapters in the textbook and the workbook both follow a well-established, clear pattern, and although they are not the same, the materials are clearly inter-related. The material presents opportunities for various work forms: round-table discussions, research, group and individual work. The teacher's book contains learning objectives, methodological suggestions and useful extra material. 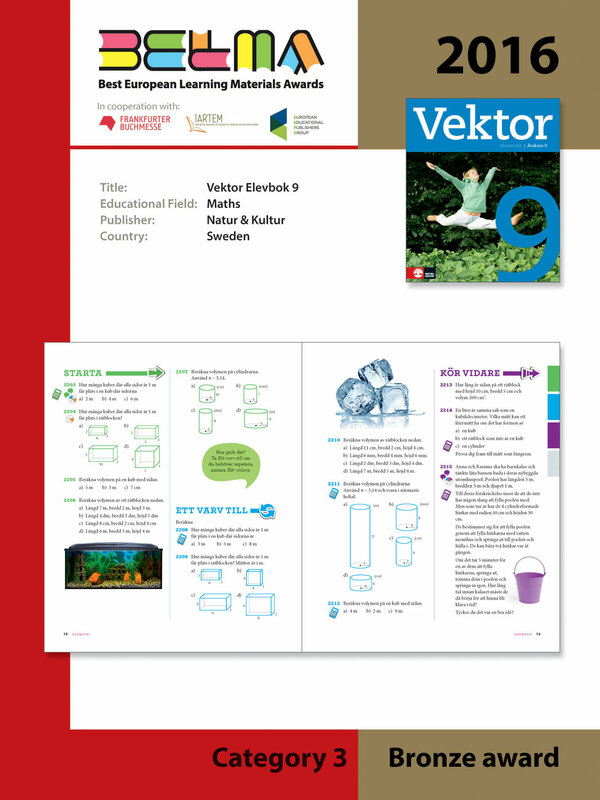 The workbook offers various exercise types, among them creative and engaging projects and translation exercises that develop the creative use of the language.